Parabolic Solar Cooker: Cantinawest's "Solar Burner"
Parabolic Solar Cooker. 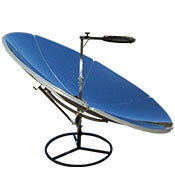 The Cantina West Parabolic Solar Burner is the most powerful and useful cooker in the parabolic class! The Parabolic class has the same application as your stove top at home. A parabolic is used quite differently than the box cooker or panel cooker, mainly because it reaches higher temperatures much faster than any other style cooker. Most people will use multiple solar cooker styles to accomplish a variety of cooking needs. The Cantina West Parabolic Solar Burner is the perfect addition to the solar cooking collection for those who need a stove top. 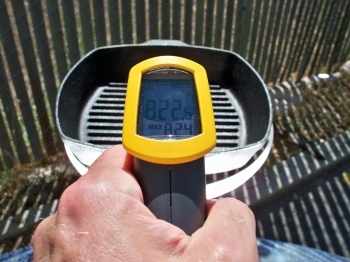 A solar parabolic cooker can reach extremely high temperatures, very quickly thus producing the possibility of burning the food if left unattended for any length of time. But if used properly the parabolic will produce great cooking results and replace the need to turn on your stove top kitchen range burners. Includes all of the Following! The principle difference between the solar ovens and the parabolic is that with an oven or panel cooker you can set your food out in the sun to cook and pretty much leave it. The necessity to adjust the panel and box cooker and to keep an eye on the food is much less with these types of cookers than with a parabolic. The solar burner has a diameter of five feet (1.5 m), which produces a high output of energy (heat) for very efficient cooking, yet it is not too large in diameter that one would have much trouble reaching the cooking plate. The focus point of the sun's rays comes together at about thirty inches above the middle, or bottom, of the parabola. Each of the six rigid, molded steel panels that form the parabola is covered with an adhesive backed reflective vinyl which is quite durable, yet easily repaired or replaced if ever damaged or worn. The reflective film on this solar cooker is the key, or means to the parabolic being able to concentrate the energy from the rays of the sun. The parabolic is supported by a circular stand (base) and has an easily adjusted crank extension arm to move the elevation tracking of the parabolic up and down, and the whole cooker swivels on its center pole base, allowing for side to side tracking of the sun. 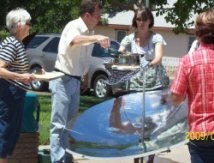 Unlike the solar ovens and panel cookers, there are no darkened pots that come included with the "Solar Burner" parabolic cooker, because in reality there is no need for a "special" pot or pan. A dark pot/pan will give you a little more advantage over a shiny pot, so you might darken the bottom of any shiny pot/pan with high temp bbq paint. The high temperatures of the parabolic are such that you can use shiny steel pots and pans (those that are more common) but it will give you a little more advantage if you have a dark colored pot/pan. With a parabolic it is more recommendable to use the heavier gauge steel pots, because the thinner variety will scorch and burn your food more easily, especially the thin aluminum, which is also known for health related issues and concerns. The "Solar Burner" is not very compact when fully assembled as are some solar ovens or panel cookers so it cannot be as easily moved from one place to another as would the smaller box and panel cookers. For most people the parabolic cooker works well as a somewhat permanent fixture around the house. 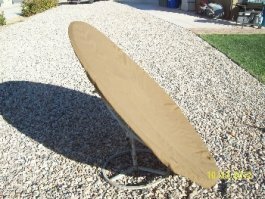 I keep my own "Solar Burner" just inside of my garage or face down in my back yard with a protective cover against the elements, and when I want to use it I only have to flip it right side up or, to pull it about two to three feet out into the sunshine. Some will store their cookers outside near the house or a shed etc. We also use a very durable solar cooker protective cover, custom fitted, that will cover the whole cooker in order to keep it from reflecting hot spots where it shouldn't when not in use, and to protect it from the elements and dust. Although the "Solar Burner" is not as compact as some cookers, I still am able to haul the parabolic all over the place on top of my van. (My parabolic is very mobile) Since it is not too heavy, I am able to lift it and place it on the roof of the van in an inverted position, or open face down. I then use some ratchet straps to secure it and have traveled hundreds of miles without any incident. The winds are no problem because the parabolic in its inverted state is very aerodynamic. If one does not have the means or the desire to transport a parabolic solar cooker in this fashion then the cooker can be fully or partially disassembled for transportation and then re-assembled upon arrival at ones destination. We use our "Solar Burner" almost every day to fry, boil, steam and brown and re-heat many of our daily meals. Some solar cooking recipes do call for browning of meats, gravies, vegetables and such so, we will often use our parabolic to accomplish this when we are in a bit of a hurry; otherwise we will also use the solar ovens and panel cookers to do the same for many of these aforementioned foods. Frying is very easily accomplished using the "Solar Burner" because of the very high temperatures. We always use a deep pan with a lid to help minimize the splattering of oil onto the parabolic, and the same goes for when boiling potatoes, pastas and such. We have fried up French fries, fish, fry bread and other items while at the same time avoiding having to heat up and "smell up" the house with the range stove top. Water can be boiled very rapidly on the parabolic solar cooker, in fact just as quickly as, and even more so, than on many electric range stove tops. We will use the parabolic to heat water for many uses during the day, besides just for cooking. We also love to pop up popcorn in a pot using popcorn oil or olive oil. With a parabolic and our solar ovens and panel cookers we are able to cook anything we desire whenever the sun is shining…which is quite often in our part of the world. How much weight can the receptacle hold? * ...We have used large pots (enamel canning bath) on our Solar Burner along with five bottles of food and the water in the pot and have cooked/boiled the bottled ingredients in as quick a time as on our electric stove top. The total weight of the pot/bottles on the parabolic was about 40 lbs. Of course we had to stabilize and reinforce the pot receptacle and post and add extra support to the base of the cooker to avoid tipping or spilling. ...food and pan/pot weight up to 25 lbs can be regularly placed on the receptacle without problem. The solar Burner is very easy to take care of and maintain. With most solar cookers the majority of maintenance will be keeping the reflective panels clean, usually free of dust, which is easily accomplished by using a soft rag to clear or wipe it clean. With a parabolic solar cooker there is always the possibility of splattering of food, liquids or grease on the reflective panels which is why one should use deep pots or pans with lids to help limit splattering. If one should have grease splatters it is best to clean the panels as soon as one has finished cooking, and you can best accomplish this by heating a pot of water with a few drops of dish detergent then softly wiping the panels with the rag and hot soapy water. After doing this use some clean water to rinse the panels and then dry the unit with a soft dry rag to prevent water spotting. This is also my preferred method of cleaning dirt and dust off of the panels as well since this will keep the reflective panels from getting scratched by wiping over the fine dust particulates. Over time and with use, if the paint chips from the metal panels or the base, you might use touch-up paint or a rust inhibitor to help protect the metal and prevent further wear. Thank you for your inquiry about the Solar Burner. 2, What is the adjustment ( up/ down) fore the Cooking platform/ Pot support)? The elevation adjustment is accomplished by rotating the little handle on the expansion rod mounted on the backside of the parabola. It is designed to be adjusted in increments. The pot recptacle does not need to be adjusted or moved. It is best to leave the pot receptacle as is once you assemble it. 3 how many pounds will the pot /cooking platform support ? From my own use and experience the pot receptacle can handle up to about 40 lbs, but most cookware and food will usually not come near to that amount of weight under normal cooking conditions. Once when I used a large enamel canning bath with six bottles of food and the water used for the steam bath, the load I had on the receptacle was about 45 lbs and it was necessary for me to counter balance the whole cooker as well as to brace and to counterweight the cooker so that the pot/pan with all of its weight did not tip the unit over forward. 5) How is the 'tracking' of the sun accomplished? In other words, does the whole base ( including the stand ) need to turn or does just the Dish support turn? 6) Is the height of the cooking platform adjustable and if yes by how much? We are one of many sellers of Solar Ovens and cookers on the market, so we promise to do our best to give you a quality purchasing experience as well as our 100% fully backed product guarantee included with all solar cookers that we offer on our site. You can try the cookers for 180 days (6 months)and if you are not fully satisfied we will refund the full price of your cooker. +No refunds or returns will be given in the case of abuse,neglect and deliberate destruction of said solar cooker in question. ++If a solar cooker arrives damaged upon receipt; at time of shipping, then we will refund the cost of the product or send you a replacement oven. Seller (Cantinawest) will cover the cost of shipping also. +++Buyer pays return shipping costs only on the regular 180 day trial return. 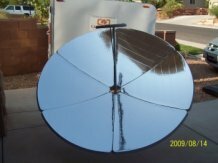 Do you own this same solar cooker? How have you used this solar cooker in a unique or different way? How have you improved this solar cooker and its capabilities?